My CNY Mommy: A Book Review: Resurrecting Anthony - "A Don't Miss Read"
A Book Review: Resurrecting Anthony - "A Don't Miss Read"
Do you like to read books? I grew up with my “nose always in a book” - there wasn’t a pastime I enjoyed more than reading. While my younger days were filled with mostly reading fiction and the occasional book on Volcanoes and Earthquakes (I know - I was a weird kid) - these days I usually read non-fiction. Although books that used to take me a day and half to read now take me a week or two with all of my time limits. So, when I do get the chance to read I like it to be a quality read - something that will help me (The fiction books can help with relaxing too!) grow as a mom, a wife, or just as a human being. Resurrecting Anthony is one of those books. At first glance I didn’t think I would like a book about a family that deals with the ramifications of a traumatic life changing event for their 12 year old son, Anthony. As a mom, wathcing the news about heart wrenching emotional stories involving kids is hard enough - I almost declined to read the book because a book you can’t “turn off” the image in your head - you are choosing to read the pages.Here is why I like what I do - writing this blog. Without it, I never would have read this book and been able to tell all of you how great this book is. 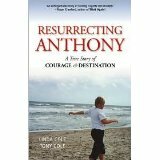 Resurrecting Anthony is written by Parents Linda & Anthony Cole (in the persepctive of Tony Cole - how unique) and how their family dealt with their son Anthony’s sudden helath crisis. 12 year old Anthony collapses on the school playground and is left without oxygen to his brain for several minutes - forever altering his life. The book takes you through the months after the crisis and through each moment - sad and happy as they work with Anthony rebuilding his life. In the midst of learning the story of their son, you find yourself rooting for his recovery, and at the end of the book realize you have learned many valuable lessons. The book is an absolute “page turner” - I stayed up way too late many nights reading when I should have gone to bed. I don’t think I have ever read a non-fiction book that I have been that interested in. One of my favorite parts of the book is near the end - where Tony uses an ice-cube as an analogy to how Anthony lives now. Wow - this is just one of the powerful messages in the book - a story of courage from parents, from Anthony and Anthony’s little Sister Alex. There was another quote in the book - one that I immediately folded the corner of the page to go back to - knowing that I would need to remind myself of it again. I feel like I know this and live like this - but to put it in the context of the story brings a whole new meaning to the words.